JetBoil has really stepped up a notch. 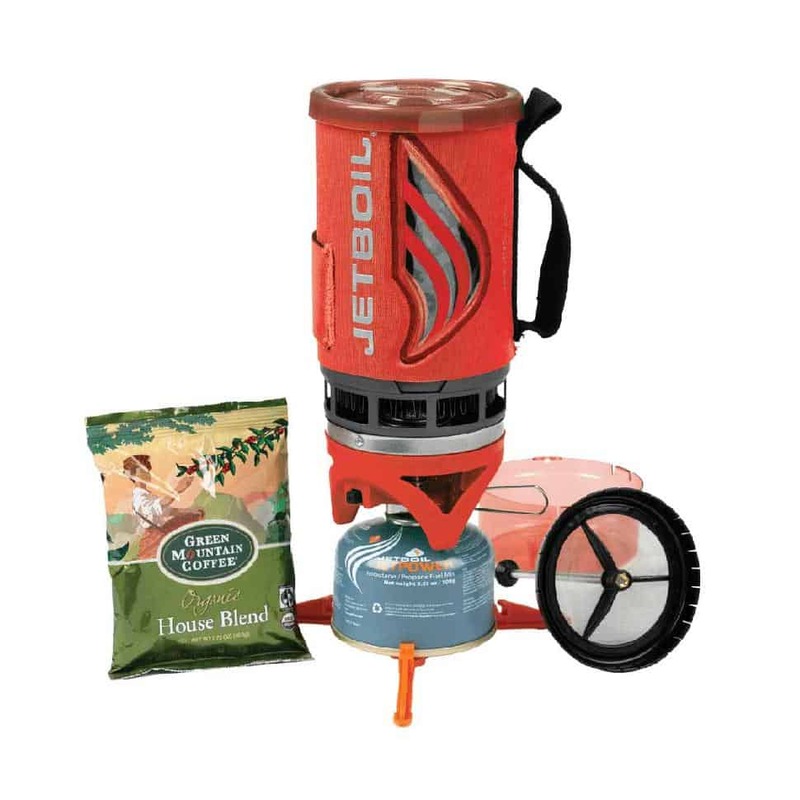 This lightweight and efficient camp stove has always been a great camp gadget for quick boil-ups. The updated version is even better, however. I just picked up the Flash Java Kit and have really enjoyed packing it along, especially on day hikes. The main difference between the new JetBoil Flash Java and the older design is an improved auto-ignition and enhanced burner and control valve. I’m glad they changed the ignition system. The older model wasn’t the best to fiddle with, especially while scalding water boiled over the lip. The Neoprene cover on the one-liter pot comes with a webbed handle and coffee-mug style sipping lid. It also does double duty as a coffee press. There’s a temperature indicator on the side of the Neoprene cover, turning a bright yellow just before the water comes to a boil. It’s a huge fuel saver; no need to keep taking off the lid to see how the water is doing. There’s a weight difference from the older model. The new design is half that of the original stove. That’s a major change. The stove is also incredibly compact. The burner assembly, pot support, and a 100-gram fuel canister all fit neatly inside the pot. It’s similar size and weight to a full Nalgene bottle. That’s cool. The only thing to keep in mind is that the JetBoil Flash Java isn’t necessarily the best choice for making culinary delights. It boils water fast (approximately one liter in two minutes) and is perfect for those pre-packaged meals. But forget simmering a homemade curry sauce or baking scones with it. With that said, it still provides a good simmer when compared to other canister stoves, especially in windy conditions. The Flash Kit is meant for just one or two people. MSR’s Reactor stove, which has a similar design, is best for larger groups. I’d still stick to an MSR Simmer Light or Dragonfly if you’re looking for a stove with versatility, however. I’m also guessing the ignition system might last as long as the classic JetBoil starter. My old stove’s igniter didn’t even last the first season. You might get two years out of it and then resort to just igniting the stove with a lighter or fire steel. I’m okay with that though. It’s still a great stove no matter what. Our writer travels to Utah, Nevada and Arizona in search of gorgeous parks and jaw-dropping views. Staying at a historic lodge nestled in the striking monuments of Utah was an unforgettable experience. Treat yourself to a weekend escape in the PNW; waterfalls and hot springs included. Sandstone mountains, slot canyons and extreme heights: can you handle these 10 hikes in Zion National Park?